The McKean County Coroner is confirming that two people were killed in a helicopter crash near Smethport. A third person, believed to be the pilot of the aircraft suffered broken bones, but survived. Pennsylvania State Police from the Kane barracks are investigating. 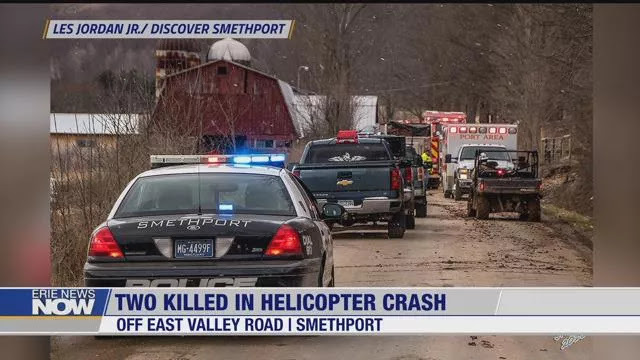 Two workers were killed when a helicopter performing maintenance on power lines crashed late Sunday afternoon 1.5 miles north of Smethport Borough in Keating Township. The fatalities confirmed by State Police at the Kane barracks and McKean County Coroner Michael Cahill. A third person in the helicopter, believed to be the pilot, suffered multiple fractures and was transported to UMPC Hamot Trauma Center by State Medevac rescue helicopter. The maintenance helicopter went down around 5:15 p.m. in a remote wooded area off East Valley Road in Smethport. State Police Cpl. Lance Schimp said investigators believe that the helicopter was hovering next to a power line, while workers tethered to the aircraft performed maintenance on the lines. The 911 Center in McKean County dispatched multiple rescue units to the scene. JoEllen Wankel, a reporter from the Bradford Era said, "The crash site is so remote, it was difficult for rescue crews to reach it." Bradford Era photographer Fran De Lancey provided a photo of rescuers heading in to the crash site. According to preliminary reports at the scene, the helicopter may belong to JWD an electrical contracting company. Erie News Now checked on line, and found J.W. Didado Electric Company in Akron, Ohio. We reached out to see if the accident involves their staff and are waiting for a response. The names of the victims are being withheld until the bodies are identified and relatives are notified. The cause of the helicopter crash is under investigation by the FAA and the NTSB.